The day to day landscape is redefined when it comes to living with a long term illness. The presence of a life altering condition is a challenge by it self. Illnesses have the capacity to take on a ‘life form of their own’. The collateral insults cause a formidable impact to the Social, Recreational & Occupational functioning. Dealing with the unforeseen chaos that follows makes it hard work. Coping with change requires constant adaptations in role & self redefinition. Most people won't be able to revisit the ‘previously well’ state of being; be it physical, social or emotional. It is therefore not uncommon for chronic stress, depression and loss of self-esteem to get rooted in. Dealing with multiple layers, exposed to emotional, physical, social, cultural, spiritual elements all at once made me feel powerless and vulnerable. The balance slowly tips over when stresses from work, home and relationships start to add in. It all becomes overwhelming at times from the impact the illness has on self, lifestyle, burden of treatment and social pressures. Not forgetting the financial constraints. Social stigma, stereotyping, fears, influences from cultural and spiritual beliefs in cases of pluralistic and secular societies can make the illness experience an emotionally draining encounter. 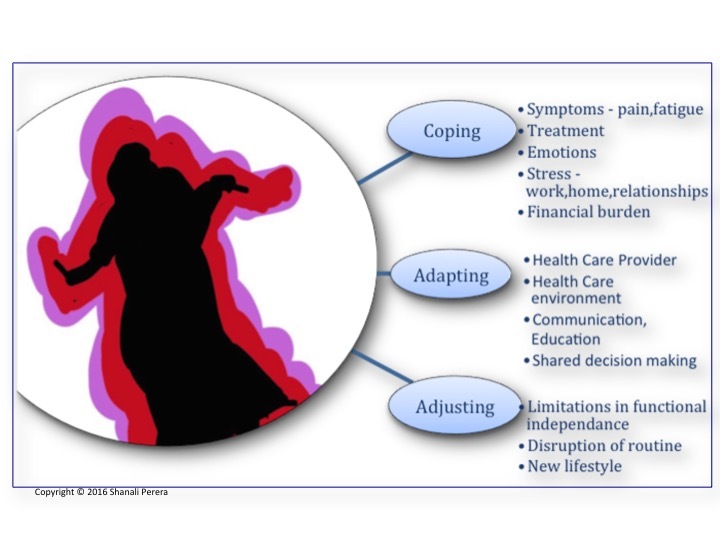 Health becomes a balance between coping, adapting, accepting vs the control of disease, pain and emotional state. Realising there’s purpose and meaning beyond the limitations imposed by illness plays a big role in taking charge to break free the binds the illness has on one's self and approach to life. My illness journey gave me the opportunity to gain considerable insight into myself and lifestyle. I had to learn to walk past old expectations and personal standards, which I had set for my your ‘pre-illness’ self. It became clear that the art of coping well is to regain control and self respect. My escape route with this battle was finding myself through the creative process. The artistic experience allowed me to express and symbolize feelings about the illness, as a whole person involvement. By changing the focus away, art offers a route to escape the restrictions imposed by the illness on self and lifestyle. I don't have control over my day, my symptoms or the course of my condition. I can however control what I create. This generates a sense of personal fulfilment which helps me to regain a level of control and self worth. I use art as a tool for mindfulness, positive reinforcement and reflective thinking. It gives me the strength to cope. It has helped me to achieve a semblance of normality and enabled me to set more realistic goals around my limitations. Art can empower and reshape life styles to better adapt to long-term conditions. Art can demonstrate the many facets of emotions and degrees of pain one goes through at various points in time which can be an effective non-verbal tool to communicate and connect with family, friends and health providers. It is an outlet that portrays the subjective experience of illness. The patient journey can be a draining encounter most of the time. Living with a chronic illness is a process. The roller coaster ride that continues. Be it new symptoms, side effects from drugs, flare up of symptoms to mood swings. Adaptive coping with newer ways to work around limitations & Integrating creativity to healing can transform challenging situations. 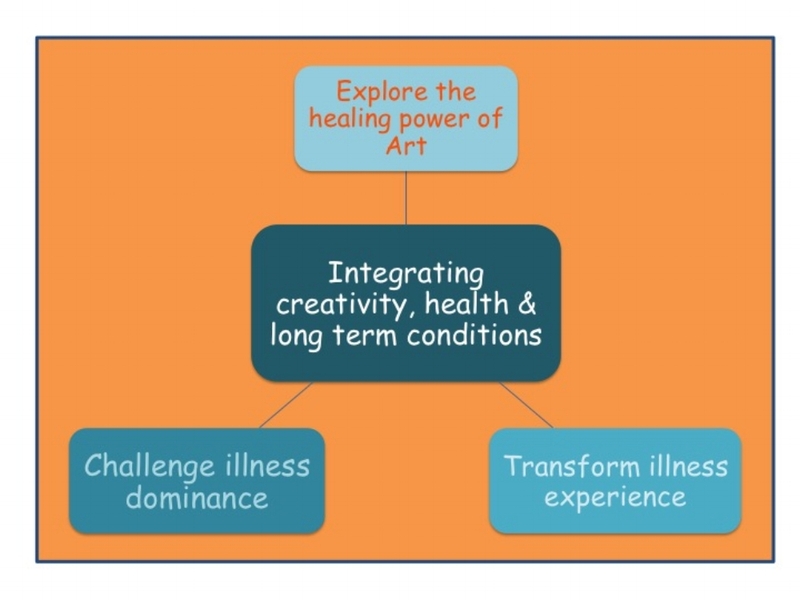 The use of art in healing combines the emotional, physical, creative, spiritual and social dimensions along with the illness and symptoms; complementing the holistic nature of the person. For many, addressing the physical element alone is not enough. The emotional and spiritual elements are all part of us. This form of self-expression is a refuge for coping with sudden changes from familiar to the new unfamiliar aspects of routine functions as a consequence of the background illness. To be seen, heard & included gives more control over day to day living. 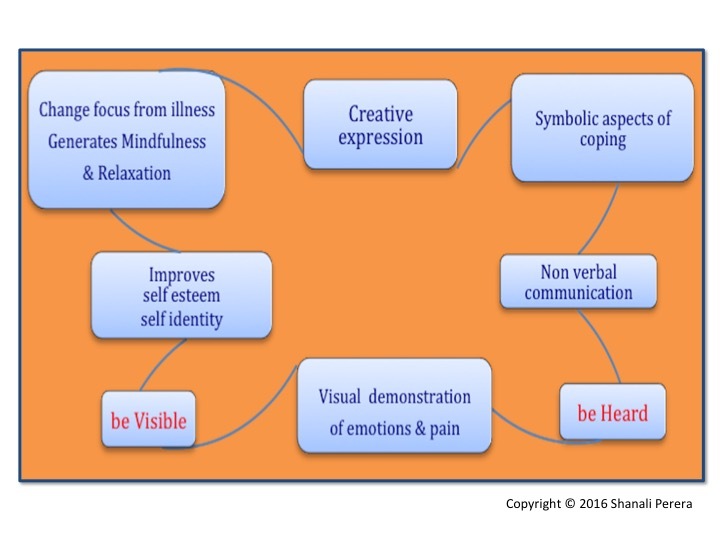 Supportive evidence highlights that the bio-psycho-social processes facilitating creative activities can reduce anxiety, depression and stress, in turn improving health outcomes. These benefits can be a catalyst for healing. Given the increasing demands on health resources, the arts have the potential to assist in promoting health and healing. Creativity can be a reservoir of healing. As a personal narrative as well as a record, Why not try visual story telling with digital art? It helped me immensely to face overwhelming periods during my patient journey. Sharing with others breaks the isolation. So, why not put this into wider use in the context of self-management of health challenges? For centuries the idea that creative expression can make a powerful contribution to the healing process was embraced by many different cultures. The creation of circular designs has been part of spiritual practices around the world, throughout recorded history. The Tibetan 'Wheel of Time' which symbolically illustrates the entire structure of the universe, is an example of one of the circular forms used for visual meditation in Eastern cultures. Swiss psychiatrist Carl G. Jung was one of the earliest founders in modern depth Psychology, credited with connecting colouring to relaxation. It was his view that these circular shapes representing typically symmetrical, repetitive or geometric designs were a calming shape to draw and colour. According to Carl Jung, "Mandalas are circular designs that reflect the wholeness of the person creating them. Psychological expression of the totality of the self" (1973) Mandala Symbolism. Princeton, NJ: Princeton University Press. The action of colouring involves both sides of the brain. The Left is responsible for logic involved in forming colours and the right for creativity, when mixing and matching colours. The whole process involved in composing visual art stimulates imagination, incorporates areas of the brain responsible for vision, memory and fine motor skills, ultimately leading to relaxation and mindfulness. Recent studies looking at physiological recordings using brain imaging techniques have allowed us to gain a better understanding of the brain mechanisms important in visual creativity. Evidence support that creative expression & output can have a favourable effect on self management, supporting wellbeing and providing a personal narrative for people who experience long term conditions.